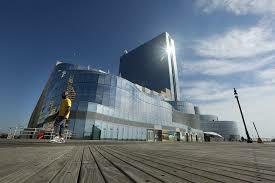 The $2.4 billion fiasco called Revel. PHOTO BY JOHN O’BOYLE, NEWARK STAR-LEDGER. A time few could imagine during the not-too-distant glory days of casino gambling has arrived in Atlantic City, where two casinos will close this weekend and a third will shut down in two weeks. I explained to the rabbit that glory days in this case meant the mid-1980s through the early 2000s, when the casinos were thriving and expanding. When Atlantic City was one of the only places in America outside of Nevada where people could gather to legally bet on table games and slot machines. When blowhards like Donald Trump were treated like geniuses by the media, simply because they’d shoehorned their way into a racket in which it was seemingly impossible to crap out. And yes, there is plenty about A.C.’s glory days in my novel Good Sal/Bad Sal. That’s just the reporter’s way of dramatizing really bad news, I told him. Anybody with an ounce of sense knows there are only so many people inclined to bet on suckers’ games, and that the pool of suckers becomes smaller if the economy tanks and the suckers realize they don’t have disposable income, what they have (had) is credit. And that A.C. would collapse unless it evolved into a resort that didn’t depend entirely on gambling to attract visitors. They gave it a halfhearted try. There are restaurants, nightclubs and live music venues, a pier that was made into a mall, and other diversions. Borgata and a few other casinos turn a profit. But for the most part the casino owners have stuck to the path of least resistance, busing in customers whose idea of a good time is feeding the slot machines, and doing next to nothing to change A.C. into a town where tourists, not to mention residents, would feel safe walking the streets. That’s it in a nutshell. This entry was posted in casinos, economic collapse, fiction, humor, mid-term elections, NJ, unemployment and tagged Atlantic city, crap-out, fiction, Good Sal/Bad Sal, Odd Man Out, Revel, Showboat, Trump Plaza. Bookmark the permalink.